When three friends in Seattle decided to open the first Starbucks in 1971, they probably did not realize it was the beginning of a new American success story. 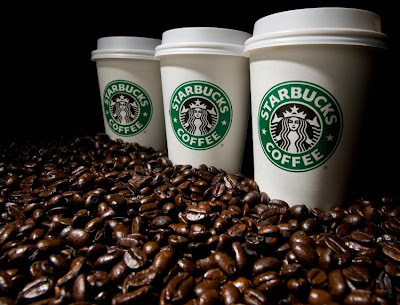 In 40 years time, the company with the twin-tailed mermaid logo has grown to become the biggest coffee retailer with 17,000 Starbucks stores worldwide, employing more than 142,000 people. The core business company sells a wide range of cups of coffee, but the multinational has also increased its sales opportunities : in each Starbucks coffeehouse, you can find tea, cookies, salads, sandwiches and pastries and also many unedible tie-in products, such as mugs or espresso machines. Now the company is competing with McDonald’s for selling coffee, but Starbucks, with its costumers' sixteen times a month visit, stays the most popular. The company has nevertheless changed habits, leading to a «Starbuckization» of the American society. Its customers are ready to pay much more than before for a cup of coffee. Starbucks has also revised the coffee tastes by raising the quality standards and influenced the urban streetscapes, opening coffeehouses on many American corners. Through the special arrangement of the stores, Starbucks has an impact on how people meet and how they consume. However, the multinational was the target in various ethical and environmental scandals, even if since a few years, the company has changed its practices. The firm really wants to show progress in this field in deciding to recycle all its cups by 2015 and so becomes the biggest retailer of fair-trade coffee in North America. As a result, the Ethisphere Magazine has appointed Starbucks as one of the ‘2010 Most Ethical Companies’.